Okay! This will be the very first time I'm posting my son's picture here. Although it is not totally the whole face, it is better than never. I would rather be more private when it comes to others privacy than me. And this that pretty much the whole world can access this blog I choose not to for now. Anyways, since he starts creeping he'll always all over the place now. 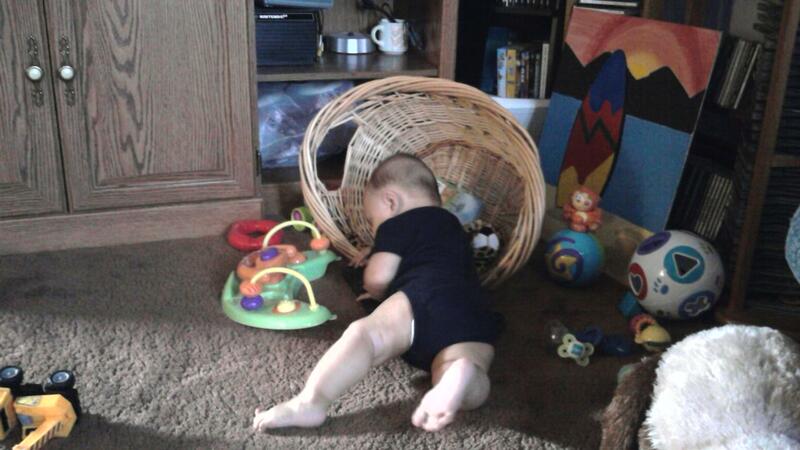 And he loves it more than me because he can reach his toys without any help from me. I can tell this kid will definitely be an independent son. Good, because I want him to be that way. Knowing that he'll be the eldest to his future sister. You may ask, How would I know this? The answer will be I don't know. But I just have the feeling. So now that he can go anywhere, he starts fishing his favorite toys and I tell you his toys is everywhere.